For golfers seeking a show-stopping environment and pristine conditions, the 7200-yard Emerald Bay is the whole enchilada. Your round gets even more interesting when the trade winds are blowing. On a course crafted by the Great White Shark himself, you can almost hear the theme from “Jaws” as you turn the corner and transition to the 11th hole. Your tee shot on this petite Par 3 is when golfers begin their adventure from tranquil inland golf to a potentially temperamental Caribbean Sea. What catches about 90 percent of the Emerald Reef golfers off guard is that they’re playing on this wondrous landscape while on vacation. This usually means they’re more relaxed. 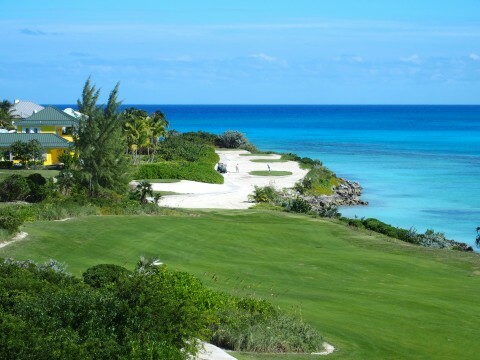 This could also mean that Great Exuma’s main drawing card can be a golfer’s undoing. 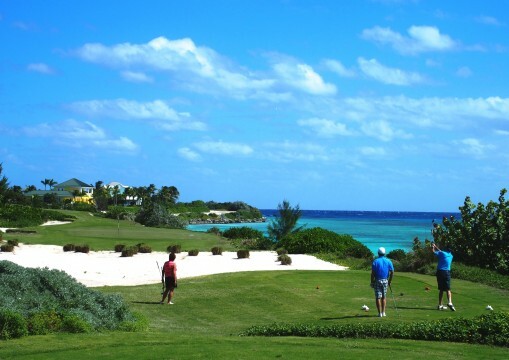 On any given day at Emerald Bay Golf Club, the question becomes, “Will the Caribbean Sea be your friend or foe? The water surrounding Emerald Bay Golf Club is “Pirates of the Caribbean” turquoise. There’s no kidding on this claim. The south end of the island is the location for the beach scenes from Johnny Depp’s movie. Now insert the creative mind of Greg Norman on this romantic island setting, and you have a golf course that might be the Eighth Wonder of the World. 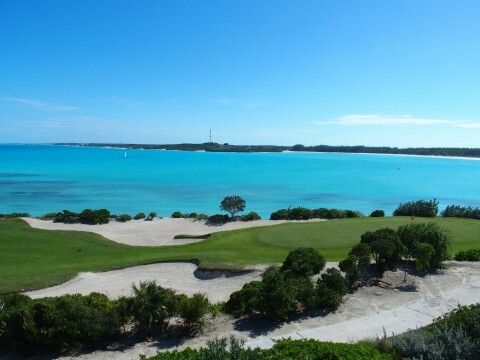 After 27 years as the Golf Professional at Cable Beach Golf Course in Nassau, Gibson arrived at Emerald Bay in 2013 and quickly tamed Greg Norman’s Caribbean crown jewel. In fact, Gibson tied the course record with nines of 36 and 30, for a scorching 66 over 18 holes. 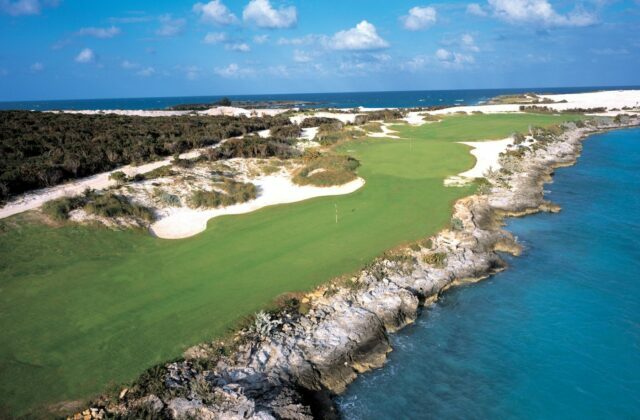 For golfers looking to improve their game while on Great Exuma, Gibson has a unique pedigree for fine tuning your game. “I was taught by Ken Venturi and Bob Toski,” Gibson said. The long and lean Gibson confided that for one whole week under Toski, he hit nothing but wedges. The first goal was to land each golf ball within a five foot radius of the others. The second goal was to get up and down within 100 yards. Gibson regularly accomplishes this goal. Imagine Gibson teaching you what Venturi and Toski taught him. If your 2015 golf vacation budget includes just one trip, then Emerald Bay Golf Club delivers a bull market return on your dollar. Emerald Reef offers superb conditions on an amazing island locale, and a closing nine deserving a place in Norman’s trophy case next to his two British Open Claret Jugs. At least a half dozen major airlines fly directly into Great Exuma’s International Airport. See for yourself about the relentless beauty of Emerald Bay’s back nine. 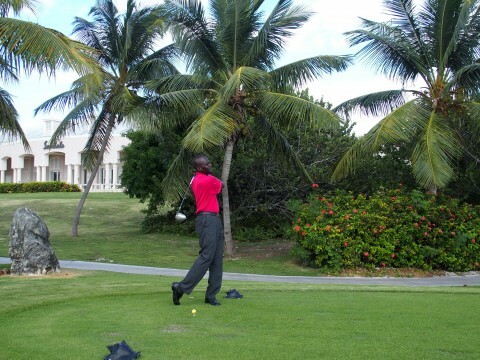 Experience what it’s like to play golf with ocean waves crashing less than a chip shot away. 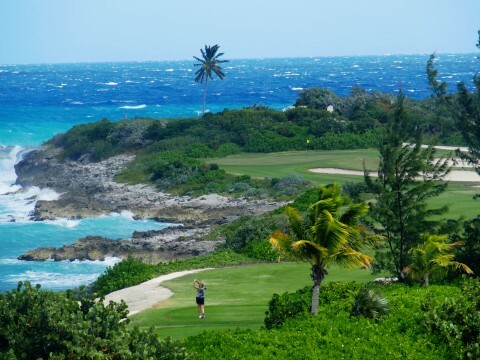 For 18 holes, imagine that you’re Captain Jack Sparrow at this Caribbean paradise turned golf course. As you sign off on your scorecard at the 18th hole, there’s only one thing left to do. Stop by the clubhouse and order a tall, cool Goombay Smash. By the time you finish the second one, everyone in your group will have tamed the beauty named Emerald Bay.